Happy pumpkin season!! As the summer passes and we’re settling back into a more normal routine I find myself spending more time in the kitchen. 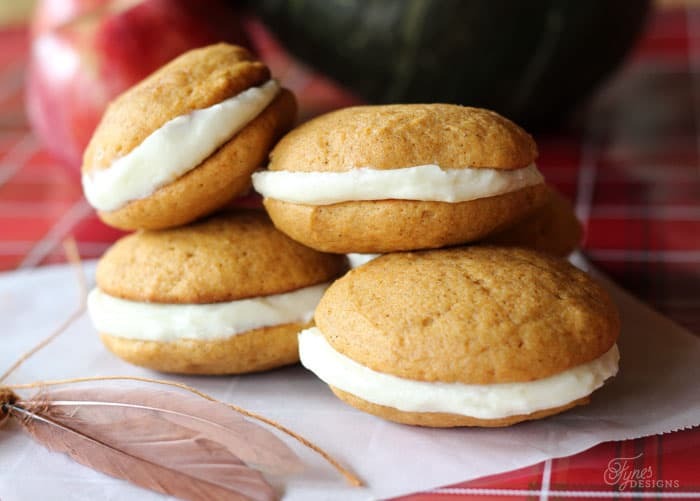 Since I just got my hands on a new Breville Handy Mix Scraper™ I had to share my newest addiction- Pumpkin Whoopie Pies with Cream Cheese Icing. These little fall delights are so soft, they are the perfect cross between cookies and cake… but called a pie! 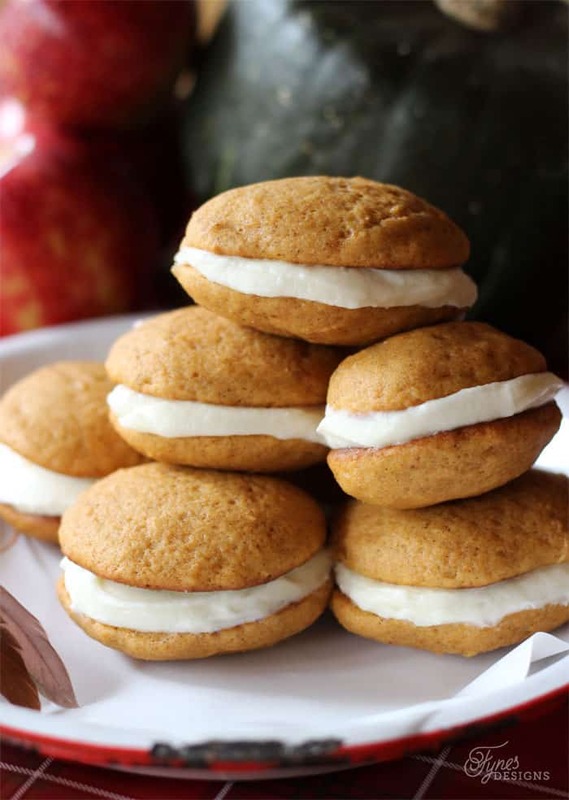 Pumpkin cookies are really to die for, just the perfect hint of pumpkin. 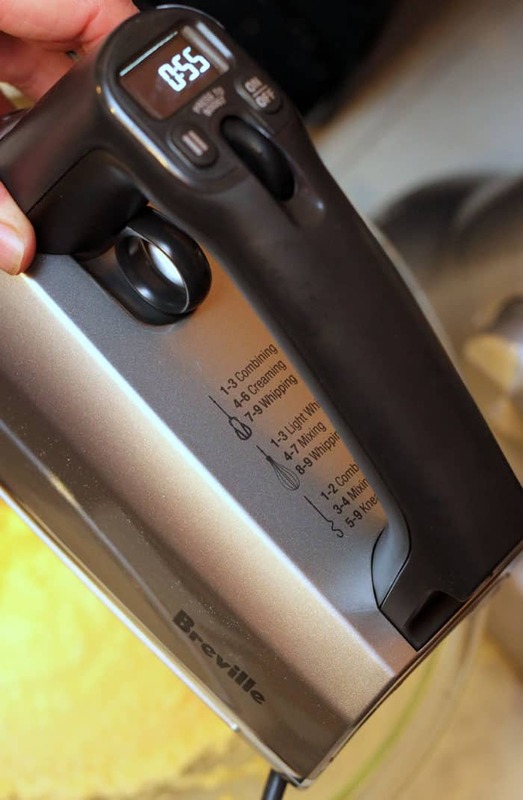 My new Breville Handy Mix Scraper™, comes with 3 sets of beaters- scraper beaters (no more bowl clanking or flower lumps stuck to the bowl) , ballon whisk, and dough hook, and because of the Beater IQ™ feature it knows which beaters you’re using it automatically adjusts to suit what you’re mixing. 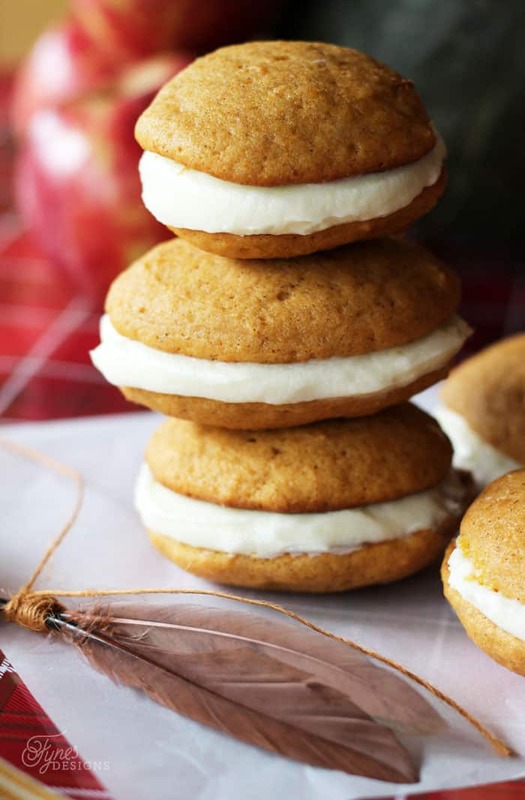 Giving you the most fluffy Pumpkin Whoopie Pies ever! 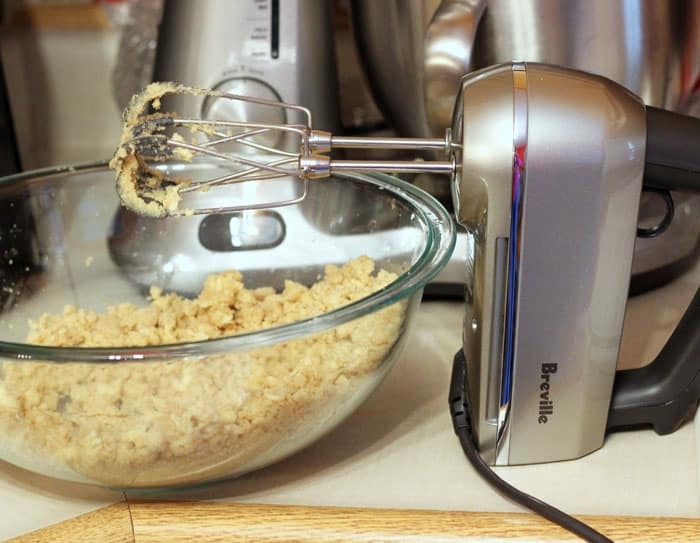 This hand held mixer packs a big punch with some really cool features, like a timer and a light! I’m talking a light that shines on the bowl, so you can see what you’re doing… or say if you’re looking for a missing egg shell #thatwouldneverhappen. The count up timer is perfect for those recipes that need precise mixing, resulting in the most delicious recipes. Cream butter and sugar together. Beat in eggs, add vanilla and pumpkin. Mix well. Using a medium scoop (or tablespoon) drop onto a parchment lined cookie sheet. 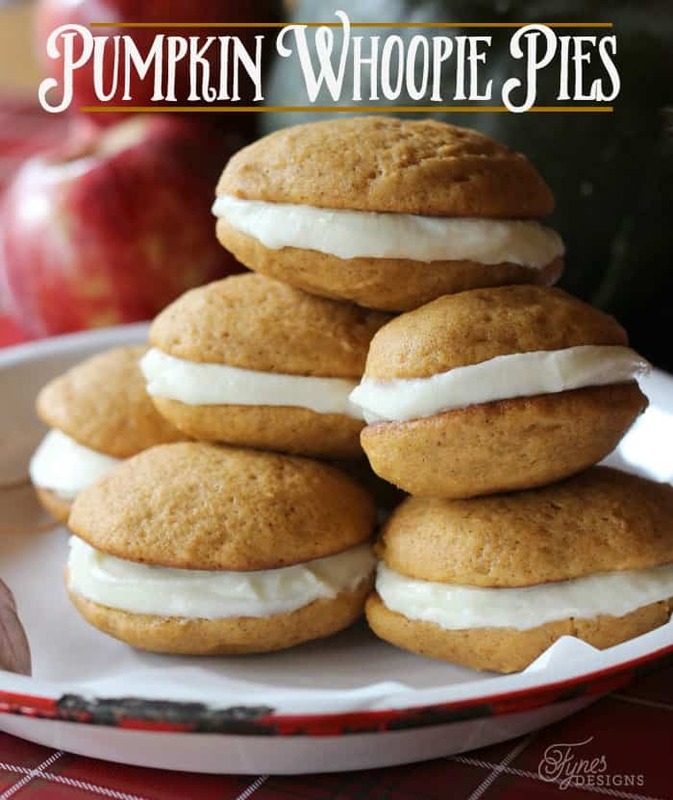 These little fall morsels are 100% kid approved, they won’t last long! Since the recipe only calls for 1 cup of pumpkin and there is about triple that amount in a can, you may as well go ahead and double the recipe right away; especially if you have little fingers dipping into the yummy batter! 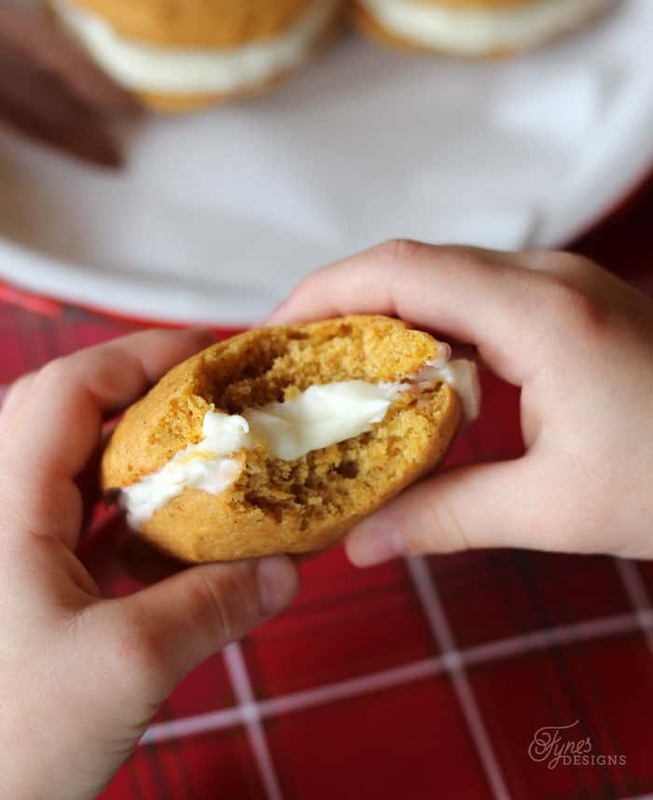 These Pumpkin Pie Cookies are going to be a great addition to our Thanksgiving lineup. I’ll definitely have the big little kids running for seconds! Disclaimer: I have created this recipe in partnership with Breville, I am not compensated for my work. All opinions, recipes, ideas and photography are my own. Sshhh, don’t tell the blogging world, but I think I like Whoopie Pies better than cup cakes and cake pops. ha ha! Thanks for sharing on Creative K Kids’ Tasty Tuesdays link up. Hope to see you back next week. ba ha ha!! Me too, always have, always will… until I run into a cream puff! They look so yummy! I’m glad I’m seeing them alone or my girls would be begging me making some… now if I try it would be a surprise for them! Thanks for sharing with us at #OMHGWW, hope to see you next week! WOW! These look so good! May try and make then ASAP lol Great job! Wow- these look amazing!! I need to try them! Can I grab one ?? 😉 Looks so yummy. Should try this some day. Thank you for sharing with us at #HomeMattersParty. We would love to see you again next week. I just popped these out of the oven and waiting to assemble. I do wonder why so much baking soda. I added 3 tsp and the taste is very overpowering. I’m sorry you didn’t enjoy them 🙁 I’ve never noticed how much is in them, or an off taste. Its a hand-me-down recipe. Thanks for catching the typo, but it should be baking powder. Excited to make these, what is the best way to store them ? Just in a plastic covered container. If you stack them, they will stick together, so you may want a parchment in between. Thanks for visiting!